I celebrated my girlfriend’s birthday this weekend with a lot of gin and plenty of food, and behold, it was very good. Somewhere in between all that, we watched two vampire movies for the first time: Matt Reeves’ Let Me In and Kathryn Bigelow’s Near Dark. This was unintended, but both of these movies are perfect for horror fans looking for stuff that deconstructs the classic vampire tale with lots of heavy genre-mixing. Near Dark, for example, is the twisted result of putting the vampire, western, and biker genres together. The outcome is over-the-top, gruesome, violence mixed in with beautiful Western landscapes and manifests on freedom. And as often is the case, it starts with a guy named Caleb (Adrian Pasdar) falling for a mysterious girl named Mae (Jenny Wright). WARNING: LOTS SPOILERS OF AHEAD FOR BOTH NEAR DARK AND LET ME IN. Caleb is riding in his pick-up one night when he encounters a drifter named Mae, who’s enjoying an ice cream cone (Can vampires eat ice cream?). At first, you must think that Mae is enchanting Caleb in order to kill him and drink his blood because SHE’S SO OBVIOUSLY A VAMPIRE. Instead, the film takes a bit of a philosophical left turn and has these two drive into the night, Caleb trying to make moves at Mae, who is only interested in stargazing and sharing her thoughts on existence. There are a couple of great lines about how Mae is delighted by the fact that she’ll be around to see the universe change throughout eternity. It creates this sort of bubble around Mae, like immortality has inspired more curiosity for life in her than the opposite, which is usually the case. These early scenes are some of the best in the film. Needless to say, Mae doesn’t try to kill Caleb (it seems she actually likes him...or just really wanted a lift home...or is bringing him to the rest of the hungry clan), but when he gets too frisky, she inadvertently bites him in the neck, which sends Caleb tumbling down a vampiric rabbit hole. Caleb gets himself into a whole mess of trouble, first abducted by Mae’s vampire clan, who want to kill him, but then reluctantly let him join the group after Mae reveals she has turned him into a vampire. The vamps in Bigelow’s movie are fed by a feeling of manifest destiny. While at times they feel shackled by their condition—Mae, for example, expresses longing for the sun, which she hasn’t seen in many years—the characters are often subversive and feel they can go wherever and do whatever they want. They’re not cunningly hunting like a Count Dracula, but savagely murdering bars full of people and mowing down policemen at motor inns. It’s to Bigelow’s credit (this was only her second feature-length film—also her second biker film!) that the vampirism isn’t campy, and even presented as a realistic infection at times. You never see the signature vampiric fangs, as the vamps just move in for the neck and bite down, blood pouring their chins. In fact, you could almost make the case that the characters aren’t vamps at all, but psychopaths who just love drinking blood. There’s one shot where the clan’s leader, Jesse (Lance Henriksen), sits a waitress on his lap so that his gal, Diamondback (Jenette Goldstein), can slit her throat. Jesse holds an empty glass mug under her opened neck to catch the blood. Then he slams it on the table, but doesn’t drink it. It’s this kind of brutality that lends the group a resemblance to the Manson family. They believe in a way of life, a future that has them coming out on top, and express their freedom through violence and chaos. This is necessary, the clan tells Caleb, who’s unable to acquire a taste for killing people. Don’t think of it as killing, Caleb. This is necessary. You have to feed. It’s all done methodically, like a cult or, well, a biker gang. That’s not to say the film isn’t campy. There’s a reason this one’s become a cult classic, and rightfully so. 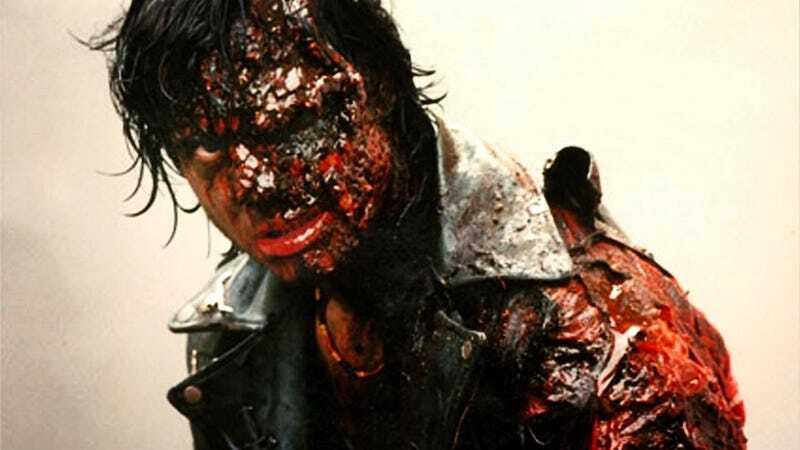 The vampires acquire terrible burns on their skin when exposed to the sun and a lot of the dialogue is absolutely the worst, most delivered by an excellent Bill Paxton—how good is this guy?! GAME OVER, MAN. GAME OVER. And something has to be said for the way the film is shot and its marvelous soundtrack. Bigelow directs the film like it’s almost sci-fi. Her camera often expresses wonderment for the universe, as we get shots of the starry night sky often to complement the characters’ true joy of the night. The soundtrack was created by Tangerine Dream, who I mostly know as the guys behind the excellent Grant Theft Auto V score. Actually, in both of these works, Tangerine Dream’s synth leads us into the weird, into the bubble universe in which these stories take place. There are sights and sounds to behold here. Overall, Near Dark is a fun movie, if somewhat trashy (how else could it be cult?) and overabundant in its gore. I’d say bring a six-pack with you for this one. Let Me In is a perfect example of vampire romance done absolutely right. Less “masochistic woman existing for man” movie (sup, Twilight) and more examination of a true bond between a bullied, unloved boy and a vampire who secretly thirsts for companionship (and blood). That’s not to say Let Me In is purely a romance—in fact, it kind of isn’t at all, since the bond between the main characters is more innocent and pure than that. There are plenty of scares in the film to make it an instant classic of the horror genre. A bit of background on this one: Matt Reeves’ version of the story is actually a remake of Let the Right One In, a Swedish movie which is in turn based on the novel of the same name by John Ajvide Lindqvist. I haven’t seen the original film or read the novel (ordered it! ), but I hear they’re also quite good. From what I can tell, Reeves, who also directed Cloverfield (my absolute fav kaiju film), does a great job honoring what came before. And it all starts with perfect casting. Chloe Grace Moretz plays the mysterious vamp girl Abby, who has moved to Los Alamos, New Mexico with her “dad” (played by the fantastic Richard Jenkins). The film starts in media res with a particularly horrific scene whose cause and effect we’ll learn later. I really liked the opening shots of the police cars and ambulance racing through the snowstorm. Very frantic. But first we meet a little boy named Owen, played by Kodi Smit-McPhee (who is set to play Nightcrawler in the upcoming X-Men film), who has a pretty tough life, both at home and in school. At home, we see him dealing with an alcoholic mother, who is not completely negligent, but doesn’t notice the signs that something is terribly wrong with her boy. Owen is bullied at school by a terrifying trio of middle schoolers, who whip him with towels in the gym locker room and give him atomic wedgies. The leader of the bullies, Kenny (Dylan Minnette, star of the new Goosebumps movie), is sadistic in his approach, a violent sociopath who haunts Owen at every turn. Owen doesn’t have any friends at all. We never see him with another person his age...or with anyone at all really. His mom is drunk on the couch most of the time, so he pulls money out of her purse and goes to the local arcade/candy store to spend his time...Alone. This, plus the time he spends stabbing a tree with a pocket knife (Owen asking the tree “Are you afraid, little girl?” before proceeding to stab it is really disturbing, and might even suggest Owen’s own violent tendencies if left unchecked. This movie seems to say that this is what happens to those who are unloved). It’s a bit of foreshadowing that keeps us guessing for a while. Will the increasingly-sociopathic Owen eventually stab and kill his tormentor Kenny? Or will he prey on little Abby, who shows up one day in the little courtyard where Owen spends most of his time? Abby the vampire, who would typically be the thing of evil in a horror movie, is actually Owen’s savior, both physically and mentally. Moretz and Smit-McPhee are brilliant together. They talk and act as kids do with each other, but with a certain hurt...if that makes sense. Owen’s (and surely Abby’s) knowledge of humanity’s dark side is already far more extensive than the average child’s. It’s incredibly smart to put these two characters together. Owen, a troubled boy, could potentially follow down the line of violence (we see why Kenny has become a terrifying bully later in the movie), and his savior is a vampire named Abby, who has no choice but to BE violent. And these two young actors portray the characters perfectly, both shells of fun-loving children that should be, expressed through their love of boring puzzles they play with in secret. Also, a nod to Minnette, who is the true antagonist of the film, and he absolutely kills it (almost literally). 1) The line of bullies that forms in the movie is a great allegory to the way vampirism is traditionally passed down from person to person. Violence gives birth to more violence in both instances. Kenny’s brother, Jimmy, bullies his little brother, who in turn bullies Owen, who is beginning to show more violent tendencies when alone. We see him eye the pocket knife at the candy/arcade/we sell knives to children store, and that sets off alarms in my head. The film is certainly used as social commentary on school shootings caused by bullying. Owen is a horrifying news headline waiting to happen. In very early stages, yes, but given some more time, he could become truly twisted. So it’s all the more interesting and affecting when the actual vampire is the one that shows him love and cares for him, and is his only friend. She breaks the chain, so to speak. 2) The film’s portrayal of women, which I can’t quite wrap my head around yet, is very worth pointing out. Owen has a negligent mother, he watches a woman in a neighboring apartment with a telescope, calls a tree “little girl” before stabbing it, and pressures Abby into being his girlfriend. Also, Kenny calls Owen a “little girl” when bullying him. And Abby tells Owen several times throughout the film that she’s “not a girl.” As far as I’ve read, I know the book and original film deal a lot with gender in a lot more overt ways, and we get a bit of that trickling down into the American version. Also worth noting that all three women are symbols/examples of family in Owen’s eyes. There’s his own mom, obviously, but he also thinks Abby has a dad, and the neighbor woman is always cradling her dog like it’s a baby. These must all be connections the movie is trying to make. Okay, so basically lots of vampires this weekend. Let Me In was my favorite of the two movies, but both films really serve different purposes. Near Dark is a splatterfest best enjoyed with some friends and a lot of alcohol, while Let Me In is really best watched alone in the dark—it’s meant to be pondered and dissected. But you can’t go wrong with either. Next weekend: less blood. Maybe. More soon.